Successfully Added Hidden Camera DVR and Working Hands-Free Bluetooth Clip (4 GB) to your Shopping Cart. This Bluetooth Clip Camera is the perfect secret device to covertly record videos and snapshot images of those around you. All while looking and function like your average Bluetooth device! Every day you can be secretly surveying everything around you with this cool Bluetooth Clip Camera. With this device in your hands, you won’t fail to record the most interesting and secret things you may come across unexpectedly. It records video and sound with the push of a button, and can also take snapshot images, so you can covertly record all the top secrets documents you want. It’s dangerous to go alone in the world without some kind of secret recording device, so you should take this and have the peace of mind that you can record anything that comes your way. This Bluetooth Clip Camera works as a convenient hands-free device for your cellphone; it’s the ultimate cover for your secret recording activities. No one will guess the little black clip attached to you is a camera. Small and lightweight, this inexpensive Bluetooth Device is a must have for people on the go that need to always be ready to answer the phone and also want to be ready to record anything they see. 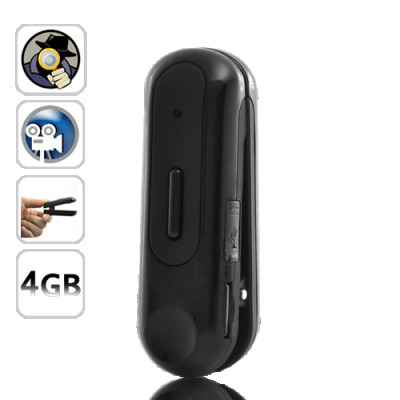 This Bluetooth Clip Camera is in stock now and available for single sample or bulk orders. A great wholesale price makes this unit perfect either for the re-sale market, OEM market, or company/personal use. As always, it is available direct to you from the original source for wholesale direct from China electronic products, Chinavasion.